In Ephesians 4:17-24 we learn there are particular dynamics of new life in Christ that contribute to our growth in holiness and increasing freedom from sin (“putting off the old self”, “being renewed in the spirit of your mind”, “putting on the new self”). This week Pastor Adam preaches on one of the most compelling aspects of Christianity: You can change. In Ephesians 4:7-16 the Apostle Paul explains that the church is the people of God, saved by the power of God, graciously gifted by God for the purposes of God. This week Pastor Adam preaches on how Jesus enables His people with spiritual gifts for the protection and health of His mission. In the continuing series “Ephesians: The Living Church” Pastor Adam Sinnett has addressed what the church is about. One of the important issues is one of unity. What do you think of when you think of unity? Reading Ephesians 4:1-6 we first need to establish what our relationships are to one another, secondly how we are to respond. This past Sunday we looked at the Apostle Paul’s doxology at the end of Ephesians chapter three, in which he praises God “who is able to do far more abundantly than all that we ask or think…” (Eph 3:20-21) Specifically, Paul is speaking of God’s unlimited power. Generally, Paul is speaking of God’s greatness. A significant reason why our faith is often so weak, our worship so dull and our praises unsung is that we’ve lost our sense of the greatness of God. In Ephesians 3:20-21 the Apostle Paul concludes the first half of his letter to the church(es) at Ephesus with a doxology, praising God “who is able to do far more abundantly than all that we ask or think…” A significant reason why our faith is often so weak, our worship so dull and our praises unsung is that we’ve lost our sense of the greatness of God. This week Pastor Adam unpacks the greatness of God and its practical implications, now and forever. In Ephesians 3:14-19 Paul encourages us to experience what we already know. Pastor Adam Sinnett uses this text as a model for us to continually affirm and be passionate about our faith. Grace. How do you define grace? In the fifth sermon in the series on Ephesians:The Living Church, Pastor Adam Sinnett uses Ephesians 2:1-10 to define grace as indispensable, costly, and an amazing gift from our creator. The christian life is becoming in practice what we already are in position, and understanding our positional reality. 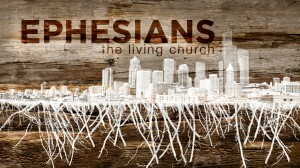 Pastor Adam Sinnett unpacks Ephesians 1:15-23 in the fourth sermon in the series on Ephesians:The Living Church.